Three years after it last played the New York Film Festival a Touch of Zen is back screening as part of the Pierre Rissient side bar. Because I’m actually going to try and get to see the film at the festival this time and because I think you should too here is the piece I did three years ago arguing as to why you should see the film at the festival. When King Hu made A TOUCH OF ZEN I doubt very much he thought he was changing the world forever. I'm very serious, for better or worse changed the world. 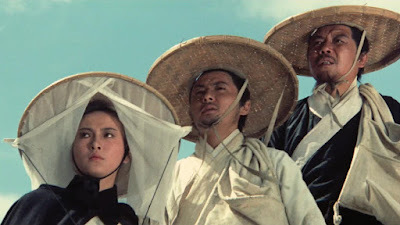 Quite simply A TOUCH OF ZEN is the film that pretty much codified the historical wu xia film as we know it. All of those films from the 1970's and 80's came from this film. There is a through line or at least a dividing line, films before and films after. You have real settings, characters that re more than cartoons, fights that enhance the plot, and the film was technically a notch above everything else. It upped the ante and showed everyone what could be done. People copied it and in so doing started to revamp a genre that would influence culture the world over. Yes I know that this is a wild over simplification, so don't send me nasty letters. I'm trying to get people to go and see it not to provide the be all and end all historical record. The film is a trip... and it's also really long. The film is 200 minutes. Its a breezy 200 minutes so don't worry.